A queen-sized quilt is folded on the bias lengthwise, about 2 feet wide, and then rolled and inserted in a custom-made pillow case. A wall quilt is loosely rolled on a swim noodle and tied in place with a fabric strip so it can stand upright in a closet. Photo by Barb Gorges. The best way to store a quilt is flat, in the dark, protected from dirt and interactions with chemicals, and at “room temperature.” Layering a few quilts on your guest bed comes close, especially if you lay old sheets between them. However, most of us have to compromise with textile collection standards. I fold my big quilts, but I try to fold them in unprecise thirds or on the bias, differently each time. I don’t want to end up with that permanent crease down the middle that is seen in so many antique quilts. After folding them in one direction, I often roll big quilts in the other direction, then put them in extra-long pillow cases I make for each quilt, either out of cheap, washed muslin or the quilt’s fabric leftovers. 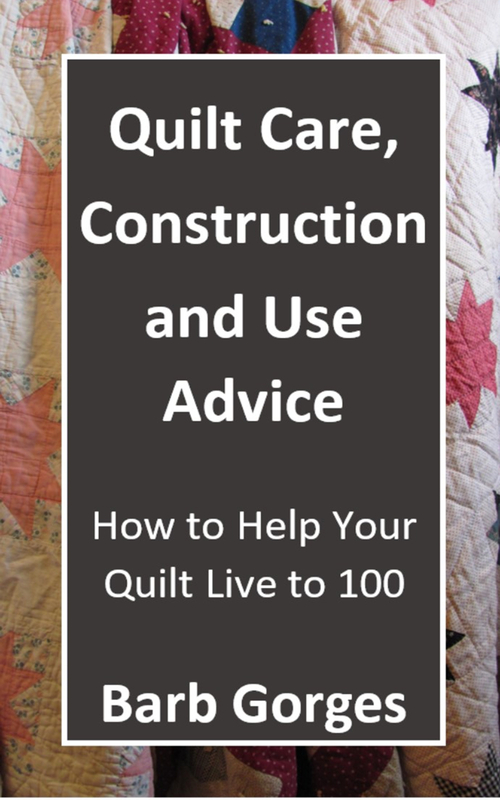 For small quilts, I use a swim noodle that is longer than the quilt is wide, or other cylinders covered in batting and muslin scraps. I roll the quilt around it, tying it loosely with a couple leftover fabric strips. I often roll more than one quilt on a noodle and top it all off with a covering of muslin. In my closet I stand the rolls upright on the protruding ends of the swim noodles. I place fragile quilts in acid-free boxes and use crumpled, washed muslin instead of tissue paper to stuff in the quilt folds and to wrap them to protect them from contact with the box. Situations you want to avoid include contact with raw wood (including cedar chests—wrap the quilt), plastic that isn’t museum conservation-quality, damp places, dirty/smelly places and anywhere temperatures get extremely hot or cold. And don’t stack quilts more than three or four deep. In whatever situation you store a quilt, it is important to take it out every several months to examine it for insect damage and to air it—and enjoy it. The first 11 parts of this series are available at this website.